We at BENZ Packaging Solutions manufacture and cater to Electronic, Automotive, Industrial, Aerospace, Heavy Plant Machinery, Retail and various other Industries for over 30 years now. BENZ Packaging Solutions VCI Products represent the finest solution for Export and Sea Worthy Packaging. We produce our Anti Corrosion and VCI Packaging Materials from Patented Propatech VCI Technology (Italy) which is present and successfully proven in the market for over 50 years now. BENZ Packaging Solutions presents its most important brands for Humidity Protection, Corrosion Prevention, Complete Packaging Solutions and Returnable Packaging Solutions. Our management team is always on research mode and looking to add more innovation into our packaging portfolio. 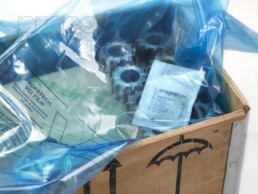 From Small Components to Machines,; all your products will benefit from custom packaging design. Our experienced package Design Team & Customer Support is keen at striking the right balance between form and function, so you receive more value for your product. Using a custom packaging design and inner packaging pieces when necessary will result in improved customer satisfaction and fewer complaints due to product damage. Propagroup was one of the first companies to be certified to standard UNI EN ISO 9001:2008 for design and production of materials, devices and accessories for protection and prevention of damages during transport and storage of finished products. Propagroup is a company specialized in design, production and distribution of packing products and systems and it has been working in the market for almost fifty years. Established in Delhi, India in 1983, the company has grown to become a world leading packaging supplier of climatic packaging solutions to manufacturers in a wide variety of industries. We Specialize in total climatic solutions to prevent moisture damage and reducing supply chain costs; From manufacturing and supplying range of VCI Papers, VCI Films, Desiccants, Barrier Foil Liners, Desiccants, Rust Preventive Oils, Inner Cushioning Materials to Outer Protective Packaging and Complete Packaging Solutions with Manpower Solutions. Industrial packaging is used to package a product during or after the manufacturing process. This is usually, but not always, done at the production site and requires specifically customized industrial packaging solutions tailored to the product in question. Protection and preservation during storage. 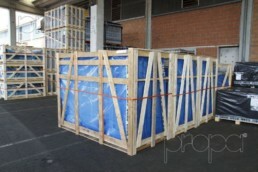 Industrial packaging differs from other types of packaging in the level of protection it provides for extended storage. Attention is given to the thickness and strength of the material that is used, as well as to closure and secure locking mechanisms. How Does VCI Work ?